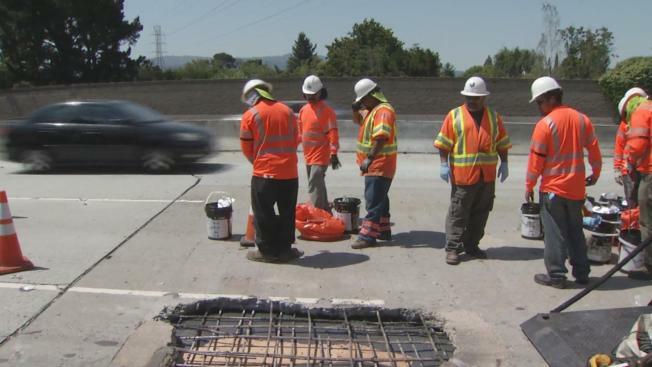 A large pothole opened up on Highway 85 in Sunnyvale on Wednesday, snarling an already busy commute and even disabling some cars before crews rushed to repair and reopen the roadway for the evening rush hour. The pothole was more than just a commute hassle. It was yet another sign of Bay Area roads in dire need of repairs. A new report found the region's crumbling roads are costing drivers thousands of dollars every year. TRIP, a national transportation research group, says the Bay Area and California need to act fast to fix their roads because things are getting worse. "More than a third of California’s major roads are in poor condition, and here in the San Jose area, 79 percent of major roads are in critical, poor or mediocre condition," said Carolyn Bonifas Kelly, associate director of research and communications with TRIP. The California Highway Patrol said Wednesday's pothole had exposed rebar, and the result was a few vehicles with flattened tires. It happened at a section of the highway where a previous pothole occurred last year, the CHP said. "We have underinvested in our transportation infrastructure," San Jose Mayor Sam Liccardo said. TRIP says the average driver in the South Bay loses $2,500 a year in auto repairs and commute delays as a result of the region’s decaying infrastructure. In response, local leaders are pushing a new measure for the November ballot, a countywide half-cent sales tax increase to fix roads and other transportation issues. Santa Clara County Supervisor Dave Cortese, who chairs the Metropolitan Transportation Commission, is urging voters to help. "The situation has gone from serious to critical, and we can't afford to wait for the state or federal government to ride to the rescue," Cortese said. "We need to dig into our own pockets and put more local dollars to work."